Doosan Industrial Vehicle UK is launching a range of trucks designed for use in cold stores and other sub-zero working environments. Branded as Doosan Ice, the freezer-specification trucks will be available across the company’s entire electric warehouse range, including reach trucks, powered pallet trucks, low-level order pickers and electric counterbalance trucks. The first Doosan Ice trucks off the production line are reach trucks with heated and insulated cabins to keep operators comfortable even when outside temperatures are as low as minus 35°c. Paul Watson, General Sales Manager for Doosan Industrial Vehicle UK, said: “The UK’s frozen food sector is growing fast and needs lift trucks that can stand up to its harsh working environment. Our new Doosan Ice trucks maximise operator comfort while providing reliability and durability even at extremely low temperatures. The Doosan Ice reach truck cabins come with fully-heated and double-glazed windows to prevent ice forming and ensure superb all round and upwards visibility. Other safety features include a two-way intercom system enabling the operator to communicate without opening the cabin door, an emergency exit window and a wide non-slip step to prevent operators slipping when entering or exiting the cabin in icy conditions. It is also available with optional drive-in racking modifications for high-density storage, a common feature of cold stores. As the extremely low temperature in cold storage warehousing places an additional strain on batteries, Doosan Ice trucks are fitted with a ‘roll-in roll-out’ battery system that means batteries can be easily and safely changed for multi-shift work. This eliminates the risks associated with overhead cranes or the use of another forklift and lift-chains. In keeping with the high-quality and robust build quality characteristic of all Doosan vehicles, the Ice reach truck’s cabin is equipped with a large safety bumper and its door handles are flush with the bodywork to prevent damage. The trucks also come with Doosan’s acclaimed 3-year / 3,000-hour warranty. 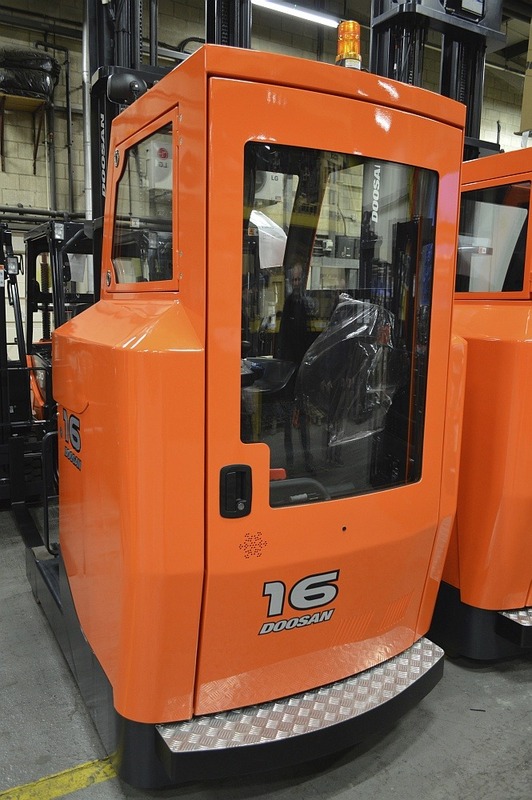 Doosan Industrial Vehicle is one of the world’s leading manufacturers of forklift trucks. A complete product range of more than 200 models from the simplest hand pallet truck to giant 25-tonne diesel trucks all offer durability, reliability and ease of use. Doosan Industrial Vehicle UK (www.doosanflt.com) is based in Northampton and is supported by a nationwide network of approved dealers. It offers the lowest total ownership cost (TCO) of any UK lift truck brand. Doosan Industrial Vehicle is part of the Doosan Group (www.doosan.com), a South Korean conglomerate with products and services ranging from power generation to engines, military equipment and construction equipment.